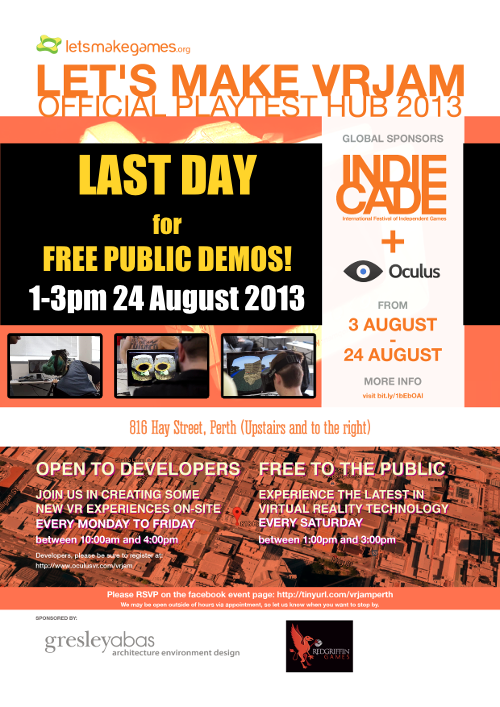 Come on down tomorrow (1-3pm Saturday 24 August 2013) for the last public open day of the VR Jam Perth Playtest Hub. It’s a great opportunity to try out the Oculus Rift, and experience the cutting edge of Virtual Reality technology. Thanks again to our sponsors and supporters (Oculus/IndieCade, Gresley Abas, and Red Griffin Games) and all of our volunteers (Minh, James, Nigel, Greg, Bobby – apologies if I’ve missed anyone). It’s been a challenging and exciting past 3 weeks. Good luck to all the jammers who will be submitting their entries this weekend!